Performers include: Kyle Chandler, Ben Mendelsohn, Linda Cardellini, Norbert Leo Butz, Jacinda Barrett, Jamie McShane, Enrique Murciano, Sam Shepard, and Sissy Spacek. 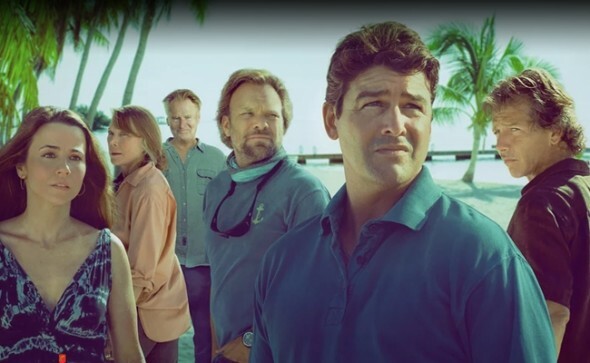 This drama-thriller TV series is set in the Florida Keys and revolves around the Rayburn family. Robert (Sam Shepard) and Sally (Sissy Spacek) own and run a beachside hotel, Rayburn House, in this beautiful location. Sally is delighted to see her eldest son, black sheep Danny (Ben Mendelsohn), when he returns home for a celebration to honor his parents. In the past, Danny has typically returned simply to borrow money and then disappeared again. When this wayward son decides to stay on, his father and his siblings are afraid of the consequences for the family. Danny’s younger brother, John (Kyle Chandler), is a local sheriff. As the son who is the anchor and protector of his family, he has a complicated relationship with his older brother. Kevin (Norbert Leo Butz), the emotionally volatile brother, does not disguise his disapproval of Danny. Meanwhile, sister Meg (Linda Cardellini) is a lawyer with romantic problems. As the present day events proceed, unsettling flashbacks from the past are shown. Dark secrets and resentments lie beneath the surface and Danny is at the center of what happened in the past. What do you think? Do you like the Bloodline TV show? Do you think it should be ending or renewed for fourth season? another great show cancelled….. why? Great story line. But, what is up with the constant use of the F word?!! Even when he proposed marriage the writers had him say, “Will you F.. in marry me?” Seriously? Can’t they write without that word ALL the time? Love this show!! Please don’t take it off air!! Renew it! I love this show! Don’t stop, Not now, there’s plenty of directions this could go. it”s a thriller-drama unlike any other ! GREAT SHOW….. DON’T STOP NOW, NOT IN THE MIDDLE OF AN APPROACHING CONFLICT. WE WANT TO SEE HOW THEY ALL DEAL WITH THE CRISIS. Hey I have a question about the show I was wondering if anyone else thought Kevin was Roy’s son????? One more thing does anyone else know what the recuring Dream that John and Meg keep having means????? Please some one is there a blog or some were that van explain season three to me i have a lot of questions . Please do not cancel this show! We just started watching it and love it! I’m sure there are more people like us that will love it once they see it. Some shows take a little more time for people to find out about it. Definitely RENEW!!!!! One of the best shows on Netflix! Renew, So we will know what John told Nolan. Maybe loose Sally, What Mother goes through all her child birth stories in such a mean fashion.